To be honest, I’m a rice person. I think no other grain in the world can compete with long grain basmati rice when it comes to flavour and aroma! Especially, I’ve always found couscous pretty bland and tasteless. But that’s before I started experimenting with it myself in the kitchen. 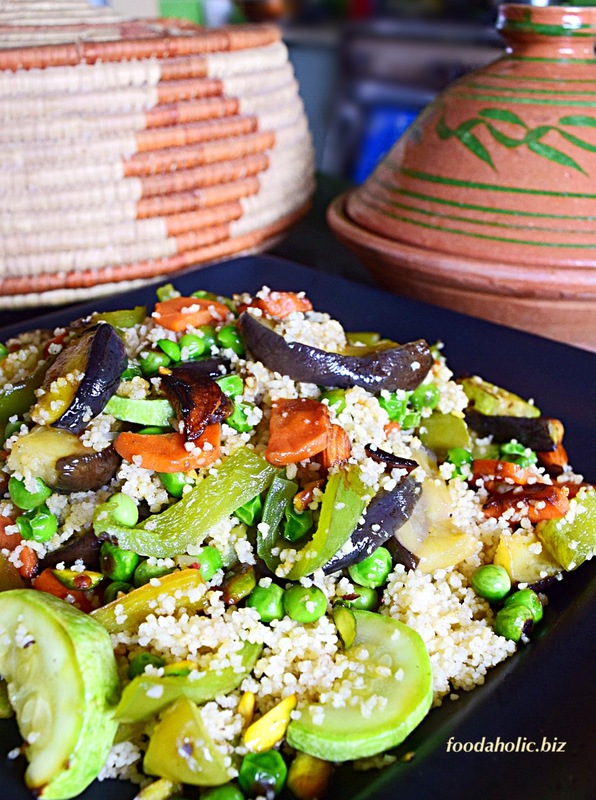 I was pleasantly surprised to discover that couscous is actually quite versatile and can be combined with any number of savoury and sweet flavours to create new and interesting recipes. What is couscous? No, it’s not a grain, though it certainly looks like that. It’s actually a very small pasta which is made of tiny granules of semolina flour, and is a traditional part of North African cuisine, also popular in MiddleEast. What I like most about preparing couscous is the fact that it gets done very quickly by simply adding some of hot water and then fluffing with a fork. Making it flavourful is simple too as it easily takes on the flavour of whatever it’s cooked with. You can add it to soups, mix it with sauteed or fresh vegetables, and as a breakfast cereal with fruits and yogurt. Making Mixed Vegetable Coucous Pilaf is my most favourite way to eat it. The recipe makes a big, nutritious and satisfying family serving in minutes. Pilaf, pulao or polow is one of the most beautiful culinary gifts the world has received from the old Persian Empire. In its most basic form, pilaf is rice, cooked in stock, combined with spices, meats and vegetables. Some of its variants are the biryani in Indian subcontinent, paella in Spain and the plov in Central Asia. Replacing rice with couscous in this quick and simple Couscous Pilaf recipe not only saves time but also provides with a good source of lean, vegetarian protein. 1-cup serving of cooked couscous has 6 grams of protein with only 0.5 grams of fat. Other grains mostly provide a lower levels of this macro-nutrient, which is needed for muscle building. Many people say that couscous is not healthy being simple carbs like any other pasta. But one cup serving of cooked couscous provides 2 grams of dietary fibre which plays a vital role in maintaining digestive health. Adding lots of sautéed vegetables and nuts to this Couscous Pilaf makes it a nutrient and fibre rich dish. Fiber is beneficial for weight management too as it absorbs water and swells in digestive tract, making us feel full for a longer time. It also binds to cholesterol in the digestive tract and removes it from body. Whole wheat couscous, made from whole wheat durum flour is more nutritious than the regular variety. And like any other food, the health factor depends largely on the quantity you eat. Wash all vegetables. Peel carrot and onion. Cut carrot, zucchini, bell pepper and eggplant into bite sized pieces. Save peels and trimmings. Add 2 cups water to a saucepan. Add whole onion, garlic cloves, ginger, tomato and trimmings from bell pepper, zucchini and carrot to the water in the pan. Add 1 tablespoon oil, 1/2 teaspoon salt and all the spices to the water in the pan too. Simmer the vegetable and spice broth on low heat, covered, till 1 cup water remains. While the broth is simmering, prepare the vegetables. Heat remaining 1 tablespoon oil in a frying pan. Add all the vegetables to the pan, sprinkle a little salt. Cover for two minutes or till the vegetables are tender crisp. Remove lid and sauté for another couple of minutes or till the carrots and eggplants are lightly caramelised outside. Remove vegetables in a bowl. Add almonds and pistachios or whatever dried fruits you want to use to the pan and sauté for a minute. Mix with the vegetables in the bowl and set aside. When the broth is done, scoop out the vegetables and spices with a slotted spoon (spoon with holes) or strain the stock, discard the vegetable and spices and pour the stock back in the same pan. Bring the stock to a quick boil. Turn the heat off. Add couscous and cover the pan for 5 minutes. After 5 minutes. Remove the lid and fluff couscous with a fork. Add fried vegetables and nuts,add lemon juice, toss to mix everything. Serve warm with mint yogurt sauce, lentils or any curry of your choice.